The director of Final Fantasy XIII doesn't want you to think his game takes players along a straight, boring line, and instead says any linearity is actually a good thing. We all know that linearity is the sign of a bad videogame. Any release that doesn't let you create your own completely unique experience every time you play should be thrown directly into the trash and forgotten about forever. Final Fantasy XIII director Motomu Toriyama oddly disagrees with this, recently posting a response on the game's official website to those that say the title is too linear for an RPG. He writes: "There have been many who expressed opinions regarding the story driven nature of FFXIII making for a linear gameplay progression so I shall briefly talk about that concept here." He goes on to explain that any linearity is intentional due to the two worlds the game takes place in: the futuristic world of Cocoon and the primeval world of Gran Pulse. "The game system itself actually changes between these two worlds, with the first half of the game taking place in Cocoon being a very story driven experience, whereas the second half in Gran Pulse is an open world design with a more free style of gameplay. 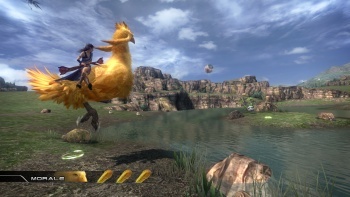 In order to allow the player to become absorbed in the drama of the storytelling and the new and exciting world of Cocoon and be drawn to the characters without getting distracted or lost we have deliberately used a linear game design for the introduction sections so they can be enjoyed in the same manner as watching a film." Toriyama says that his team at Square Enix was going for a FPS "vibe" where the player "rapidly progresses through a series of dramatic events and experiences one after the other on an imposing and atmospheric battlefield." This early linear section also allows the player to get the hang of Final Fantasy XIII's new battle system, according to Toriyama. I don't import, nor am I special, so I have not played Final Fantasy XIII yet, but what Toriyama describes here sounds exactly like almost every other Final Fantasy game. Western RPGs tend to be built around open worlds, but JRPGs like Final Fantasy usually work just like Toriyama says FFXIII works: a huge portion of linearity, followed by open-world exploration (usually accompanied by the acquisition of an airship). This structure is in fact a staple of JRPG design. I would never want to see a series like Final Fantasy go into the realm of total linearity, cutting out any exploration or side-RPG elements, though I won't know how well FFXIII incorporates these until it hits shelves on March 9. Depending on how long each world lasts, and how truthful Toriyama's statements are, Final Fantasy XIII's partially linear structure might be nothing new at all. Author's Note: The first two lines of this article are sarcasm.